Your donations are still needed to guarantee that Serpentini Chevrolet Stadium is completed for the 2011 football season. Visitor Side Stands completely removed and new stands seating 800 installed just in time for the 2010 football season. The East Side stands will be expanded from the current 800 seats to 2,000 seats this summer. New landscaping, walkways, fencing and convenient wheelchair accessible ramping is part of the East side stand renovations. 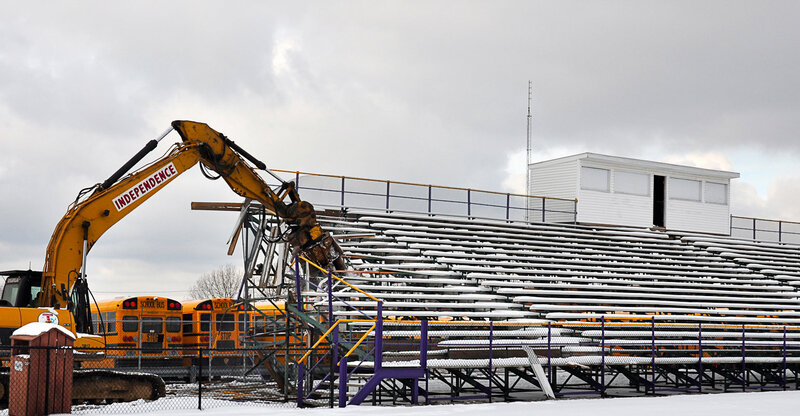 Demolition of the football stadium stands at North Royalton High School began on a snowy Monday January 10th, 2011. The old homeside stands at Gibson Field are No More! View full sizeThe longstanding 1,900-seat home grandstand at the newly named Serpentini Chevrolet Stadium in North Royalton will be replaced by a 3,000-seat grandstand as part of the "Turf the Field" project set to completely renovate the athletic site in time for the fall sports season. Plans call also for a new press box. The bid process for the new bleachers will commence by February with anticipated installation coming this summer.